Toyota has enhanced the comfort quotient of its best-selling MPV, the Innova Crysta and its tough off-roader, the Fortuner via the addition of some new features. 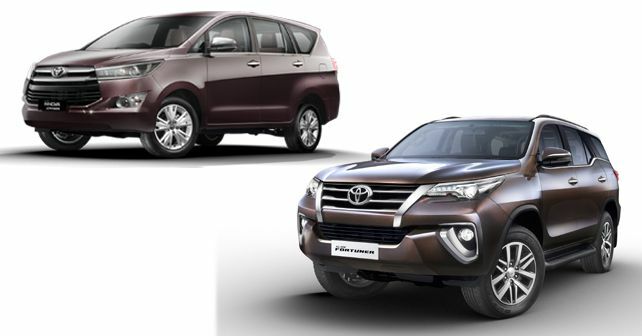 Owing to customer demand, Toyota Kirloskar Motor (TKM) has added some sought-after features to its best-selling models, the Innova Crysta and the Fortuner. As for the changes, the additions have only taken place inside the cars, meaning that they remain unchanged both visually as well as mechanically. On the price front, the updated Innova Crysta range starts from ₹ 14.93 lakh while the updated Fortuner has been priced at ₹ 27.83 lakh (all prices are Ex-showroom). The Innova Touring Sport, which has also received a few updates, is now available from ₹ 18.92 lakh. Coming to the updates, the Innova Crysta now gets a new Ivory leather upholstery colour, perforated leather seats with an embossed 'Crysta' insignia, heat-rejection glass and a USB fast-charge port. Out of all these, only the last two features have found their way on to the Innova Touring Sport. Further, these new features will be rolled out only on the diesel variants. Meanwhile, the list of updates on the Fortuner is smaller in comparison, with a new 'Chamois' interior colour, perforated seats and heat-rejection glass making it to the list. Like the Innova, only select variants of the Fortuner will be rolled out with the new features (4X2 AT, 4X4 MT & 4X4 AT diesel variants only). The Innova and the Fortuner, ever since their India launch in 2005 and 2009, respectively, have been the leaders in their respective segments. While Toyota has managed to sell over 8,00,000 units of the Innova since 2005, over 2,25,000 units out of them are of the Innova Crysta (launched in 2016). Meanwhile, Toyota has managed to shift over 1,50,000 units of the Fortuner since 2009.